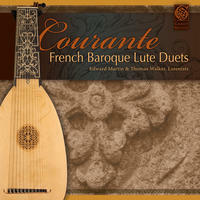 Edward Martin and Thomas Walker: French lute duets that represent the pinnacle of the high baroque. 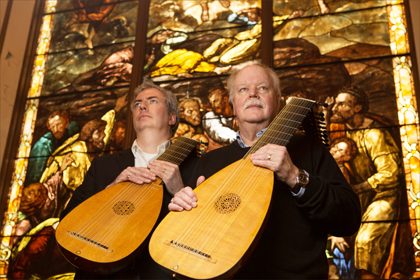 Edward Martin (lute, vihuela da mano) has studied with lutenists Paul O'Dette, Toyohiko Satoh, and Hopkinson Smith. He holds the position of Adjunct Professor of Lute at the College of Saint Scholastica. In 1984, he performed in the First International Lute Competition in Toronto. Having extensively performed throughout the United States, Martin has made recordings for Minnesota Public Radio, and these performances have also been broadcast on the American Public Radio network. He is a member of various ensembles, a duo with tenor William Bastian, and a baroque lute duo with lutenist Paul Berget, this newly formed baroque duo with Thomas Walker, and Duo Chambure with vihuelist Phil Rukavina. In the summer of 1997 and 2001 he was invited to be the Renaissance lute instructor at the SFEMS Renaissance week at the Dominican College, San Rafael, California. He has frequently been guest lecturer, teacher, and performer at annual summer seminar of the Lute Society of America, and serves on its Board of Directors. He has also performed in Spain and the Netherlands. Ed Martin is widely known for his recordings here on the Magnatune label. Thomas Walker began classical guitar lessons at ten years old. He was captivated by the music of Leo Kottke a couple of years later and continued studies at MacPhail School of Music in Minneapolis with Jack McNally. This led to an interest in jazz as well as a renewed interest in classical music; in college, he studied music theory and classical guitar. He studied jazz independently by extensively transcribing the solo work of Joe Pass. In college Thomas became interested in Renaissance and baroque music as well; this led by degrees to an interest in the lute some years later. He bought his first lute in 1992 and started studies with Phillip Rukavina shortly thereafter. With Phillip as mentor, he graduated from student to colleague and has since performed with Minnesota lutenists Rockford Mjos, Paul Berget, and Edward Martin as well as Phillip, in various lute ensembles. Additionally, Thomas has performed solo and with the Venere Lute Quartet, the Rose Ensemble, Ensemble Polaris, Consortium Carissimi, members of the Lyra Baroque Orchestra, and other baroque and Renaissance specialists in the Twin Cities. Thomas appeared on the performer's roster at the biannual Lute Society of America Festival in 2008 and 2010. He has two solo CDs exploring the Seicento, Toccata released in 2006 and Stile Moderno, Stile Antico in 2010. Additionally, he has a CD of lute duets recorded with Phillip Rukavina, Due, which is a survey of Continental and English lute duets from the 16th to the early 17th century. Edward Martin and Thomas Walker lives in Minnesota, USA. Tagged as: Classical, Renaissance, Instrumental, Composer: Charles Mouton, Sports football betting appComposer: Denis Gaultier, Composer: Ennemond Vieux Gaultier, Composer: Francois Dufault, Composer: Pierre Dubut, Lute. Paul Beier: solo lute of the Italian renaissance.